10,000+ women take the road safety pledge with Honda this International Women’s Day! New Delhi: The world is celebrating International Women’s Day today with a strong call for #PressforProgress. Spreading road safety awareness among women, Honda Motorcycle and Scooter India Pvt. Ltd. today started a new chapter of #HelmetOnLifeOn initiative exclusively for female. 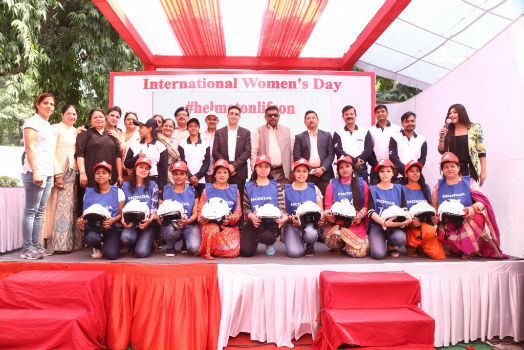 More than 10,000 women across 12 cities in India took the #HelmetOnLifeOn pledge. Over 18 million new two-wheelers are coming on Indian roads every year. More and more women, be it working professionals, college-goers, home-makers or even senior citizens are now realizing their dreams as independent riders on roads. Making this journey for women even more safe on roads, Honda is spreading awareness on importance of wearing helmet on road with its #HelmetOnLifeOn initiative. 1. Dream Riding – Honda’s skilled female safety instructors trained more than 700 women in Jalandhar, Kolkata, Pune, Noida and Hyderabad to become independent scooter riders in just 4 hours. The specially designed Dream Riding course saw women go through both theory and practical riding free of cost. 2. HelmetOnLifeOn – Across all cities, Honda’s safety instructors spread awareness of how to be safe on roads. Women were educated on the importance of safe braking, maintaining correct posture while riding, need of wearing appropriate riding gear and even how to mount and de-mount a two-wheeler using center stand. 3. Riding Trainer for aspiring women riders – Honda also gave a unique opportunity to many women to experience real life traffic experience with Honda’s proprietary Riding Trainer. The state of art, simulator familiarized women across India with the dangers on road in a safe manner. Many women were delighted as they for the first time got a chance to practice the clutch operations of a motorcycle through the riding trainer. 4. Fun Learning – Ensuring that women understood message of road safety through fun approach, Honda also organized special road safety quiz with prizes, lucky draw competitions with the fun coming from gaming and mehendi zone. For Honda 2Wheelers India, road safety comes first. Till date, Honda has educated more than 17 lac Indians on road safety. Leading the cause, Honda has adopted a total of 13 traffic parks in Delhi (2), Jaipur, Chandigarh, Bhubaneswar, Cuttack, Yeola (Nashik), Hyderabad, Indore, Ludhiana, Coimbatore, Karnal and Thane.